It's my pleasure to present an interview today with the author of The Legends of the Goldens series, S.B.K. Burns! 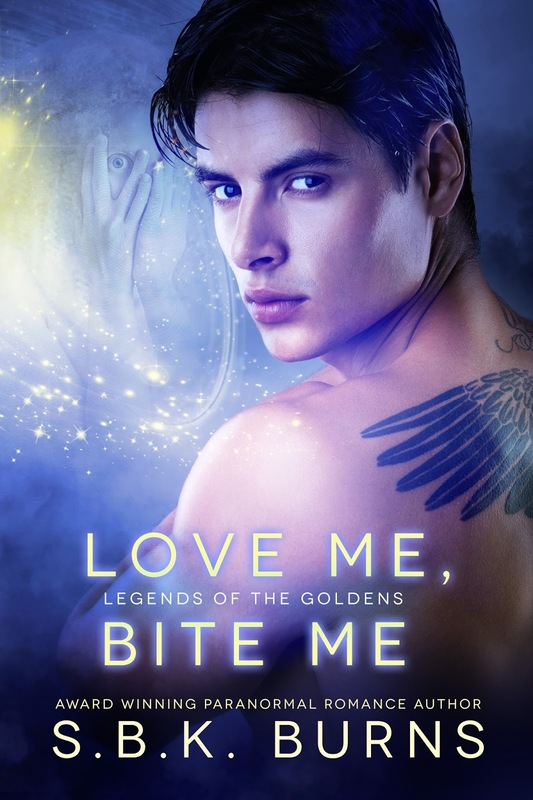 Book two of the series, Love Me, Bite Me, released August 28, 2015. Let's check out the exciting details about this author and her fascinating book series! The Tale Temptress: How long have you wanted to be a writer? S.B.K. Burns: Actually, my parents were part-time actors in little theater, so they brought scripts home. I consumed those, and Shakespearean plays voraciously. As a teen, I wrote musicals and poetry. The Tale Temptress: What drew you to the Young Adult market, and have you or will you be writing in any other genres? S.B.K. Burns: Besides poetry, mostly about nature. I loved to experiment, so I pursued science in college. But then I wanted to teach field biology, get my middle school and junior high kids out in nature. Along with that, I was active in the community in local and national science fairs. So when I finally started to write as part of a local group of creative writers, my voice was for a younger, new adult audience. The Tale Temptress: How did you come up with the idea for the Legends of the Goldens series? Tell us a little bit about it. S.B.K. Burns: The Legends of the Goldens series right now is composed of four books. The first two were published by Soul Mate Publishing, rising star in the publishing industry. They liked my work because they are always looking for authors who write mixed genres. The most recent books in the series are self-published prequels to the others. At $0.99 for both, they were written to generate interest in the first two books. The first book I wrote in the Legends series, FORBIDDEN PLAYGROUND, was motivated by the news about albinos being massacred for their body parts because an African gang thought the white skin had magic powers. What I wondered was, what would happen if an albino space alien civilization landed on Earth only wanting to help humans and they allowed themselves to be slaughtered by these gangs? The Goldens are that alien civilization, arriving from the stars with their android slaves, to not only help humans, but to help themselves. Goldens are psychic vampires, related to and pursued through space by the nasty kind, the Dacons. The Golden’s psychic ability is called orbweaving, meaning they open doors into other parallel or sequential universes to change things. But changing things psychically is exhausting and they don’t know how to chill. Earth humans do, which is the reason the Goldens returned to Earth. 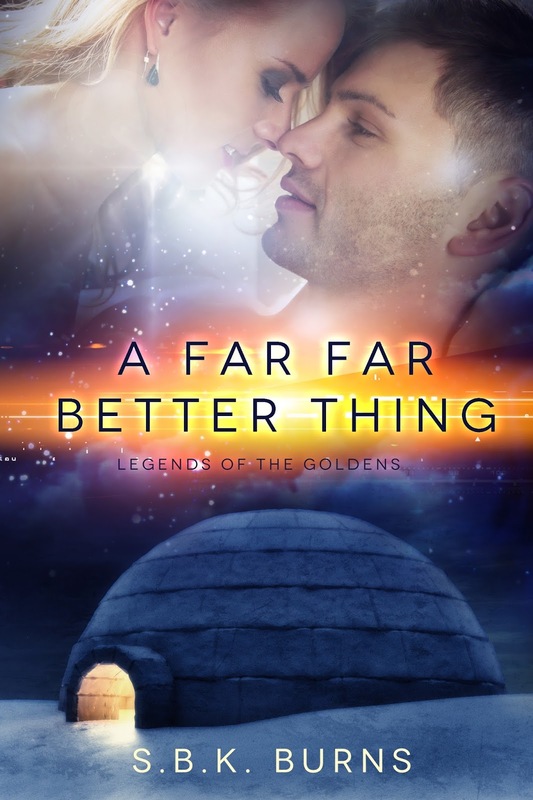 In the process of hybridizing psychically with humans (psychic engineering), there was an accidental hybrid born naturally (Book 1: A FAR FAR BETTER THING) who would disrupt their plans and their whole way of life. 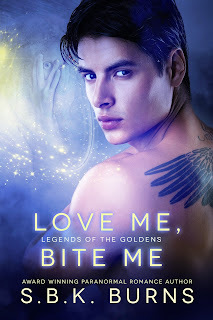 The most recent release LOVE ME, BITE ME is about that hybrid and how she planned to bond with a human to save him from losing his soul to the Dacon clan of baddies. The Tale Temptress: How are the books connected? S.B.K. Burns: The underlying theme of all the books is the acceptance of diversity and that love can only exist between equals and without prejudice. The books in the LEGENDS series are connected by generations of Goldens and Golden hybrids. The first book A FAR FAR BETTER THING is about how the first natural hybrid, Chastity, came into being. Her mother, a Golden, Kira, falls for an android, Max, from the servant class. In the second book LOVE ME, BITE ME, the Goldens place Chastity in a foster home with a very special human from the Maclaurin family. It seems he’s the only one who is more psychically powerful than she is. She becomes romantically involved with the leader of the Dacon clan of vampires. The third book introduces Chastity after she’s taken her vows as a monk-like Golden elder who works to save her nieces and nephew hybrids. Two hybrids, Akeelah and Saffron, that grow up together in Tanzania, fall in love in FORBIDDEN PLAYGROUND. In DANCING DRAGONS, their child, Andrew, falls for a human, a Maclaurin who has the power to put him in his place. The Tale Temptress: Tell us a little about the Goldens’ psychic consciousness and how it translates into time travel through parallel universes? S.B.K. Burns: According to Golden legends, their world is only virtual. They can close their eyes and a sphere of equally spaced stars appear in the black sky of their minds. Depending on what they want at the moment, one of the stars comes forward approaches them as a portal into another world, the one they seek. The world can be past, present, future, altered or not. They have the power to send vampire, human, or android away to whichever world they want, but their world only becomes real to a person if that person believes in it enough. The Tale Temptress: How is the spiritual part actually science fiction? S.B.K. Burns: The orbing or orbweaving, teleporting from one world to the next is based on another theme of the LEGENDS OF THE GOLDENS SERIES: We all know humans can take uppers to rev them up, to help them concentrate and they can take downers to help them to chill out and relax. Well, it seems the Golden race can rev themselves up to do all the miraculous orbweaving things they do. And humans, especially the Maclaurins, can slow themselves down to be everywhere at once. Each travel the worlds of space and time, but in different ways. The spiritual part happens when humans slow down enough to attain a blissful state of mind to be everywhere, everywhen, and everything at once. A place where no one and nothing can hurt them. The Tale Temptress: What was the most challenging aspect to writing this story? S.B.K. Burns: The most challenging part is taking all the themes and theories and making them accessible to my audience. Lots of things happen, lots of changes occur, maybe more than in most romances, and so I need to find a way to clue the reader into where the characters are at any place in time. The Tale Temptress: Do you have a favorite character who really spoke to your heart? And if so, who and why? S.B.K. Burns: A character, Red Maclaurin, is bi-sexual (or maybe multisexual—anything that walks, he says jokingly). He’s the most powerful human who can protect man from any and all alien invaders. He has ADHD and so he needs to take uppers (like caffeine) in order to be less disruptive to the Goldens. He can’t, at least through the first four books, stay in love or stay with anyone for any amount of time. He’s mostly a comic relief, but he surprises us in that he has the power and will to save both the humans and Goldens, or to love powerfully enough to sacrifice himself for others. The Tale Temptress: You have other works as well. Which of your books brought out the most emotion in you while writing, and why? S.B.K. 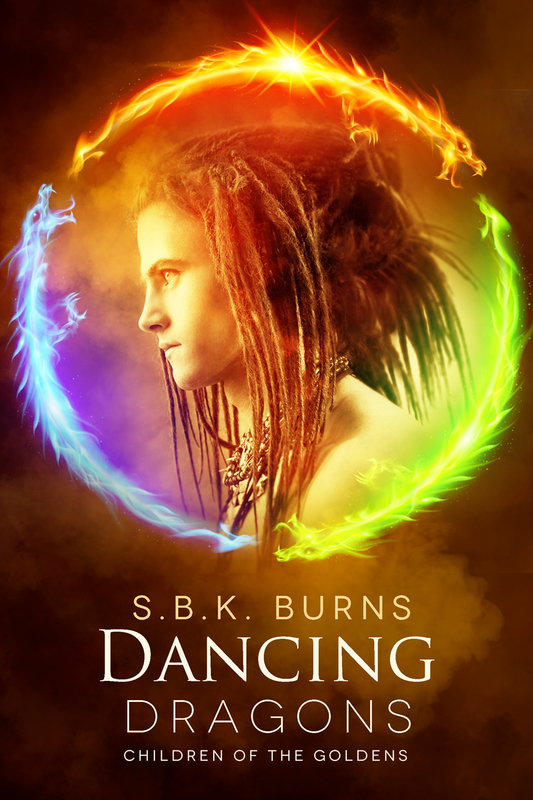 Burns: Because I write mostly sci-fi romance, I decided to try contemporary romance like some of my critique partners write. I entered an RWA contest and won first prize for my New Adult tennis contemporary, A PERFECT MATCH, about romance at the US Open Tennis Championships in NYC. Though it hasn’t as yet been picked up by any major publishers, I’m always moved by the final love scene where the hero (who his whole life has been plagued by a sociopathic mother) finally feels as though he belongs somewhere. The Tale Temptress: When you were first beginning as a writer, what were the best resources you used/found for learning your craft? S.B.K. Burns: Though I’ve read many self-help books, the best resource as a continuing writer has been an attitude toward learning and growing as a writer. As a scientist with two advanced degrees in engineering, I flogged myself, I crammed for exams. Now, I keep my creating separate from my editing and I learn as I go, open to feedback from my audience. With this method, I haven’t yet suffered from writer’s block. The Tale Temptress: Are you a pre-planner or are you a “seat of your pants” writer? S.B.K. Burns: It’s more fun to be surprised as my characters lead me through the story, but I still plot out my chapters by suggesting the Point of View characters in each scene, where the scene takes place, and what the scene’s about. The Tale Temptress: What has been the most rewarding experience you’ve had since first publishing? S.B.K. Burns: When somebody out there—neither friend nor family—reviews my books and gets it, gets the message I’m trying to convey. The Tale Temptress: What has the self-publishing experience been like for you? Have there been any special challenges? S.B.K. Burns: I have about 60 people in local writing groups that are my first audience. Then I have a great NA paranormal editor who mainly gives me feedback on what does and doesn’t make sense for a young audience. She lets me keep my voice and I believe her editing is in more depth than the editors provided by my first three publishers (Black Opal Books, Whiskey Creek, and Soul Mate). To be fair to my previous editors, they worked on a tight timeline and probably were given more books to edit than my present editor. Of course, I need to set up my own reviews, ads, blog tours, and other social media announcements. But that’s true when using small, medium, and or even large publishers. The Tale Temptress: Do you have any favorite authors or stories that have inspired you as a writer? S.B.K. Burns: In science fiction, I liked Clifford Simak, Isaac Asimov, Heinlein, and Bradbury. Recently, the sci-fi romance, Sharon Lynn Fisher’s book, GHOST PLANET. And for YA, THE FOREST OF HANDS AND TEETH by Carrie Ryan—I really wasn’t into zombies, but the book is so good, it just sucked me in. I hear they’re going to start movie production on it soon. The Tale Temptress: For our aspiring writers out there, what is your best piece of advice? S.B.K. Burns: Create folders of all your story ideas and from time to time work on them simultaneously. The more distracted you are by your works in progress, the less focused you’ll be on what you’ve already released. Remember, what you’re working on right now is way better than what you’ve done before. And your next book will be even better. The Tale Temptress: Will you be taking part in any blog tours, signings or book blitzes that your readers might like to know about? I have information going out via twitter. I also have news on my website— www.susanburnsauthor.com and I have ads out all over the romance blogs. The Tale Temptress: Can you give us readers any clues about your next writing project? [Complete] AGES OF INVENTION SERIES: Book 2: Fly Like An Eagle - NA time travel/alternate science history: 19th century. Set for release in 2015. [Complete] A PERFECT MATCH - NA contemporary/elements of suspense. Set for release in 2015/16. [Work In Progress] FLAT SPIN - sci-fi romance military thriller/space opera. Set for release in 2016. [Next] Working title: AN OKAY WHATEVER-I-AM - YA 1st person sci-fi thriller romance featuring a group of teen hackers who work together to save the world. A very large thank-you to S.B.K. Burns for taking time to answer my questions!